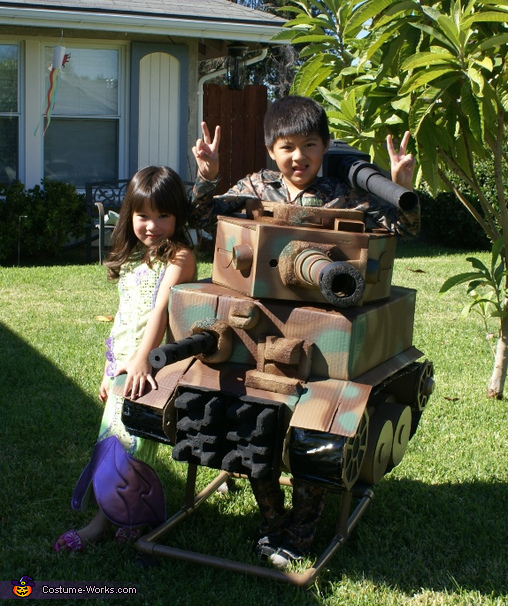 This cutest Tiger tank is made of 100% used material such as cardboard boxes, kitchen paper towel roll, mail shipping tubes, packaging form, packaging air bag for tracks and used PVC tubes with used chair wheels. Like the other interesting fun homemade tank post, the project started small and intended to be shoulder straps carry by my son, but it soon went way out of hand as I want it to be as close to the real Tiger tank as possible and in the same time I need to keep an eye on the over all weight and size to fit thorough the doors, on top of that it needs to be able to fit a person, so the turret needs to be a bit bigger than the perfect scaled down size. Trying to be true to the real Tiger tank, a scaled down drawing was carefully drawn up and 3D drafting skill did come in handy on this project. Turret was redesigned & remade for 3 times, the wheels were remade twice. It's a project that needs a lot of time, patience and awful lot of measurements. On a 5 star difficulty scale this tank should be a 4 star project. Overall duration was 2 month with 1 or 2 hours a day and 4, 5 hours on Sundays. On the top side, the only thing I paid was the spray paints about $15, the trade off is the time spent on design, making it and scavenge for materials. On the last photo, the swords are handmade with wood and they are 95% similar to the swords in the famous game/movie/animation Final Fantasy.